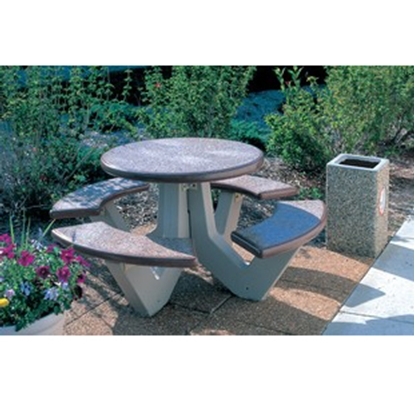 Commercial Round Picnic Tables from Park Tables are always on sale! Quick ship options available for fast delivery to your business. Choose from a wide selection of colors, sizes, and materials - all at the best price. 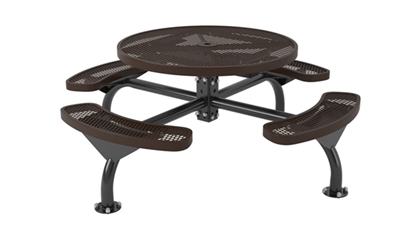 ELITE Series Round Thermoplastic Metal Picnic Table, Seats 8 Adults, Portable, 221 lbs. RHINO Wheelchair Accessible Round Thermoplastic Metal Picnic Table, Universal Access, 3 Seats Portable or Surface Mount, 210 lbs. 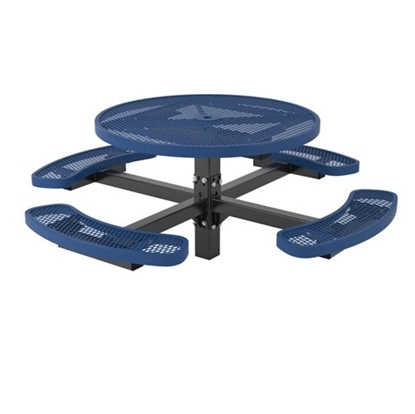 ELITE Series Wheelchair Accessible Round Solid Top Thermoplastic Metal Picnic Table, Seats 8 Adults, 3 Seats, Portable or Surface Mount, 270 lbs. 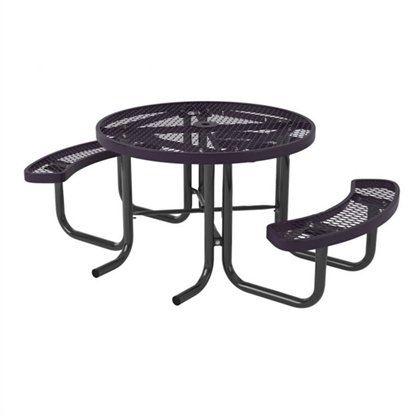 RHINO Round Solid Top Thermoplastic Metal Picnic Table, Seats 8 Adults, Portable, 182 lbs. 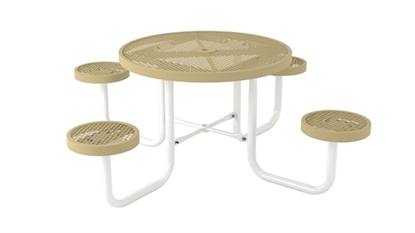 ELITE Series Wheelchair Accessible Nexus 46" Round Solid Top Thermoplastic Metal Picnic Table, 3 Attached Seats, Stationary Mount, 337 lbs. 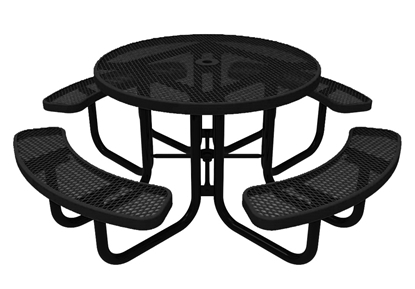 ELITE Series Nexus 46" Round Solid Top Thermoplastic Metal Picnic Table, Seats 8 Adults, Surface or Inground Mount, 386 lbs. 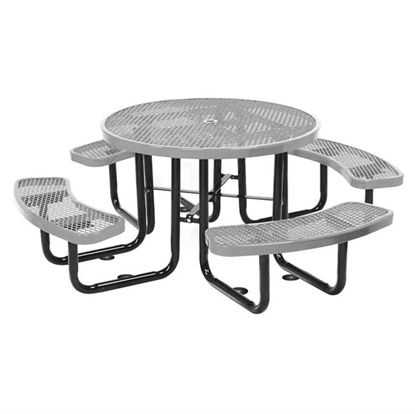 ELITE Series Wheelchair Accessible 46" Round Pedestal Solid Top Thermoplastic Metal Picnic Table, 3 Attached Seats, Stationary Mount, 337 lbs. 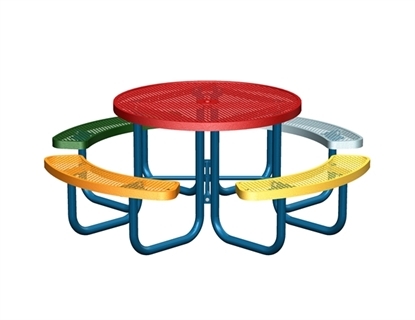 ELITE Series 46" Round Pedestal Solid Top Thermoplastic Metal Picnic Table, Seats 8 Adults, Surface or Inground Mount, 386 lbs. Round Concrete Picnic Table, ADA Compliant, Concrete Top with Bolted Frame, 860 lbs. 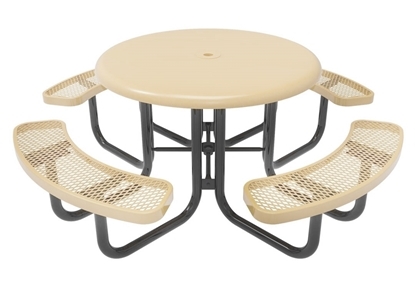 Round Thermoplastic Steel Picnic Table, Regal Style Seats 8 Adults, 255 lbs. 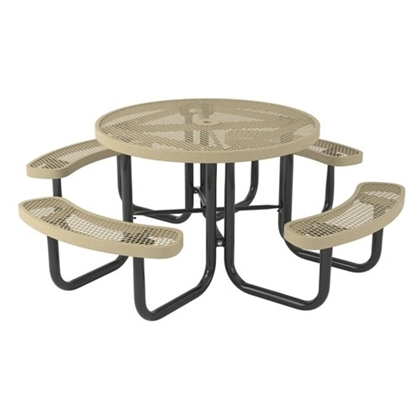 Round Thermoplastic Steel Picnic Table, Regal Style Seats 8 Adults, 200 lbs. 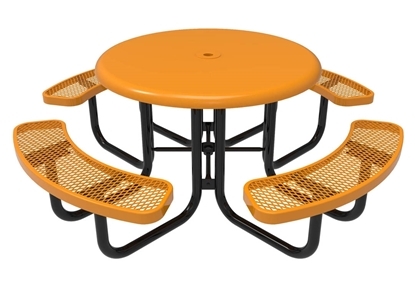 Round picnic tables are a favorite for public schools, arenas and stadiums, churches, fast food restaurants and food courts. The round shape creates a natural social setting for enjoying and interacting with your friends. 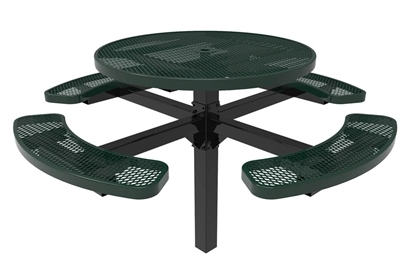 Round picnic tables are the most popular table for outdoor corporate meeting settings, food courts and stadium canteen dining areas. For instance, General Motors uses these picnic tables at some of their locations for meetings.